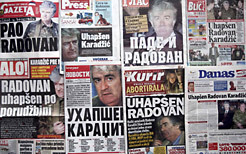 "They Arrested Karadzic" Uhapsen Karadzic. The phone seems to have gone mad; shortly after 23:30 a fury of text messages. Until yesterday night, the expression "they arrested Karadzic (or Mladic)" was a sort of a joke between colleagues. It was not rare that a phone call from a colleague, for example on a Sunday morning or late in the evening, would start with "they arrested Karadzic". However, the surprise did not last long. This time, however, the surprise was real. By now, everyone seemed to have reconciled with the idea that the two super-fugitives would escape justice. The European Union (EU) countries, except for the Netherlands and Belgium, left the impression that Serbia's path towards the EU would be easier, irrespective of the arrests of the remaining fugitives: Radovan Karadzic, Ratko Mladic, and Goran Hadzic. Certainly, no one explicitly said, "We are not interested in Karadzic and Mladic." However, everything indicated that the so-called EU conditionality towards Serbia, grounded in the demand for full collaboration with the Hague Tribunal, would have loosened. The EU's Enlargement Commissioner, Olli Rehn, had recently addressed directly the issue of full cooperation by Serbia but only in terms of Belgrade demonstrating that the fugitives are not in Serbia, and guaranteeing easier access to state archives. Serbia recently signed a preliminary Stabilization and Association Agreement (SAA) with the EU, which awaits ratification both from the Serbian as well as the parliaments of EU member states. The SAA has been temporarily put on standby pending specific results from Serbia, after the Netherlands and Belgium vetoed the proposal to open the road for Serbia without a clear demonstration by Belgrade that it would cooperate fully with the ICTY. The new chief prosecutor of the Hague Tribunal, Serge Brammertz, who took over from Carla del Ponte in the beginning of the year, states his position in Belgrade on July 23. According to many analysts, Brammertz will present a report that should definitely be positive. Javier Solana himself expressed hope the report by the ICTY prosecution would be absolutely positive: a step closer to the EU. The wind of change has arrived in Belgrade. After the presidential elections won by Boris Tadic, the parliamentary ones won by the coalition of pro-European parties led also by Tadic, and, not least, the forming of a government in alliance with the Serbian Socialist Party (SPS), formerly the party of Milosevic and now led by Ivica Dacic, the current Interior Minister, came also the news of Karadzic's arrest. Serbia seems to have recovered the spirit of reform promoted by Djindjic and which cost him his life in March 2003. Back then, dark forces in Serbia - a tangle of politics, crime, and secret services - did not allow the epochal change envisaged by Djindjic and achieved over the last several months. Only in the last several days has it become clear that there have been other changes, away from the focus of international attention. There is above all the replacement on July 17 of Rade Bulatovic with Sasa Vukadinovic as the director of Serbian intelligence, BIA (Information and Security Agency). Carla del Ponte particularly disliked Bulatovic. In addition, there has been a change in the team in charge of cooperation with the ICTY, finding, and arrest of fugitives. The new team had its first meeting only yesterday. Something was clearly changing when another fugitive, Stojan Zupljanin, was arrested less than a month ago. Nevertheless, the president of the National Council for Cooperation with the ICTY, Rasim Ljajic, made statements for the news agency Tanjug on Sunday July 20 that did not indicate that things could move so fast. Ljajic reiterated the fugitives were not in Serbia, that the country did not seek any excuses, and that until that point it had handed over 43 indictees to the ICTY. He added that the team for cooperation with the ICTY, with its two new members - Sasa Vukadinovic and the new Interior Minister, Ivica Dacic - would continue to operate "perhaps with new responsibilities and competences." Although the Interior Minister promptly stated he had not taken part in the arrest operation, it is clear that he had not impeded it. In the past, an indictee (Goran Hadzic) who was just about to be arrested was warned and managed to escape. The "new" Serbian Socialist Party is not yet fully convinced that Serbian citizens should be extradited to the Hague. Nevertheless politics moves on and a protection mechanism that lasted for 13 years seems to have finally cracked. The fear that the streets of Belgrade might "inflame" over the capture of a Serbian "hero" seems unfounded. Only a small group of young men with T-shirts of the extreme right wing movement "Obraz" protested at the Square of the Republic and in front of the court yesterday. There was, however, not even a glimpse of the masses that would be ready to defend the presumed "Serbian heroes".